I love sweets. Give me a vanilla milkshake, a chocolate cupcake, a jelly doughnut, a warm peanut butter cookie, a slice of strawberry cheesecake, or a lemon tart, and I will be a very happy girl. I don't discriminate when it comes to desserts. I love them all. But when it comes down to it, it's pie that, errr, takes the cake. When I was a little girl, it only took a promise of custard pie or lemon meringue pie for me to be on my very best behavior. These days, a piece of blueberry pie topped with vanilla bean ice cream can make my entire week. 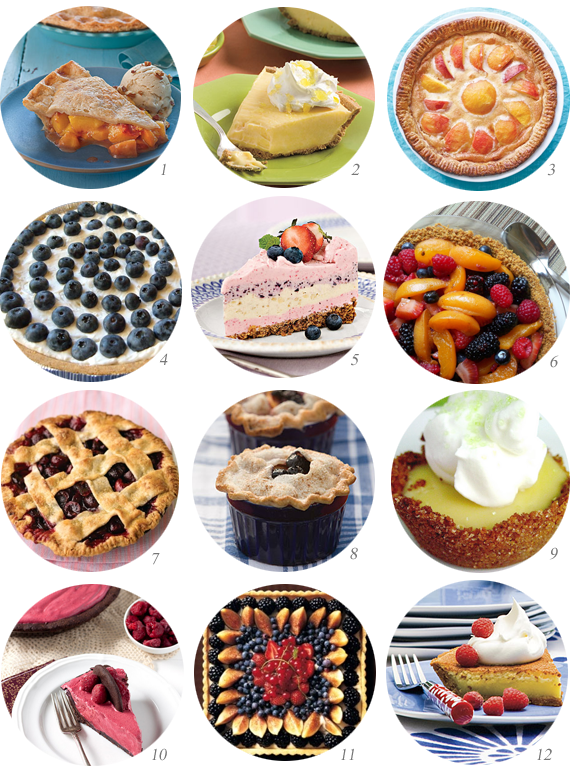 So today, I decided to share some of my favorite summertime pie recipes (because let's face it, summer pies are the best pies) with you. And if you have one that I missed, be sure to let me know. The more pie the better. I need to try making more pies. I tend to only make pumpkin pie because it's so simple. Oh my gosh...This post is like a [pie] slice of heaven! I love sweets too. Can't help it. That #5 up there is screaming at me. I might have to make it this weekend! Yummo! You had me at brown sugar cinnamon peach! I love sweets too, and pie definitely tops the list. Can't wait to try some of these out! I can not say no to those! You're a girl after my own heart, Melissa! When it comes to desserts, I don't discriminate... but for me, the very best pie will always be the apple pie that my grandma baked; countless people have tried to follow her recipe, but what they come out with is never the same, sadly. These days, since I live in France, I get my pie in tart form - there's nothing quite like having a little lemon meringue pie just for you! ( * Q * ) Thanks for sharing!!! i love sweets too. this post is making me drool. i remember choosing lemon meringue pie one year for my birthday. i adore it so. Ooh this is perfect timing because I just got a gorgeous pie dish for my birthday!